Porcelain Veneers are the ideal choice for improving your smile, and they have become increasingly popular due to their simplicity and versatility. Placing custom veneers requires a high degree of technical skill as well as attention to cosmetic detail. Dr. Browne routinely places veneers, and she designs each case individually to match and enhance the characteristics of each patient’s smile. NOTE: It is important to understand that veneers are cosmetic only, they do not fix issues such as decay. Any other issues such as decay or gum disease need to be addressed prior to even considering veneers. Exam – We examine your teeth to see if veneers are right for you. Photos – We also take digital photos of your mouth. Digital Mock-up – Using imaging software, we enhance the digital photos of your mouth to show how your smile will look with the addition of veneers. Decision – The entire purpose of the first visit is to allow us to give you everything that you need in order to make an informed decision on whether or not to proceed. Once you make your decision, we schedule your second appointment. Prepare Surface of Teeth – On your second visit, we prepare your teeth for the veneers. In order to make room for the veneers, we remove about ½ millimeter of enamel from the surface of each tooth that will receive a veneer. Impressions – Next, we take impressions of your tooth or teeth to send to the lab to create the veneers. Lab – We send the impressions to the lab for them to create the veneers. Fabrication usually takes one to two weeks. Temporary Veneers – Before you leave from your second appointment, we put temporary veneers on your teeth. Check Fit & Color – When your veneers are ready, you return and we temporarily place the veneers on your teeth to check the fit and color matching. 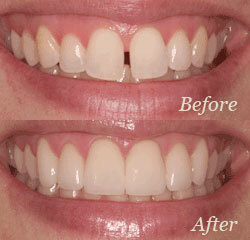 Trim – We trim and adjust the veneers as needed. Clean – We clean all of your teeth, and we etch (etching creates a stronger bond) those to receive the veneers. 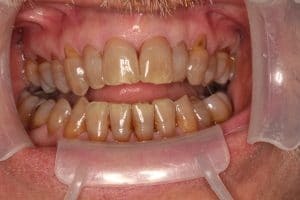 Cement – We then cement the veneers onto your teeth and a special light is used to rapidly cure the cement. Final Adjustments – After a couple of final adjustments, you are good to go with your brand new smile! Are you ready to find out whether porcelain veneers are right for you? Please call our office (406) 442-0282 or contact us today for an appointment with Dr. Browne at Montana Roots Dental Care in Helena, MT. Veneers do not require any special care, just typical good hygiene. Continue brushing and flossing as you did before. You may notice a slight difference in the feel of your teeth after the placement of veneers due to the change in thickness from your teeth. If you care for the teeth they are on, veneers will typically last a decade or more. 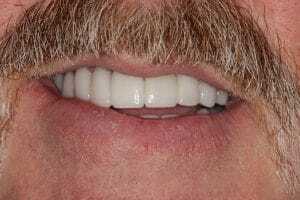 What Is The Difference Between A Porcelain Veneer And A Ceramic Veneer? If you have ever been confused by porcelain and ceramic, you are not the only one! While there is a difference between ceramic and porcelain in our everyday life, in dentistry when someone refers to ceramic material, they are referring to porcelain. Dental-grade porcelain is a ceramic that is made from a more highly refined clay material than the clay used to make non-dental ceramics. Just remember that in dentistry, ceramic veneers and porcelain veneers are two ways of describing the same thing — a beautiful tooth-like material that is placed over the front part of your teeth to give you a smile you will want to show everyone! This is another very common question that we get asked. The truth is they are very similar, and some dentists might even say they are the same thing. But, at Montana Roots Dental Care, we want to make sure you understand the difference between the two. Require less tooth to be trimmed away than a crown. In some cases, a veneer can be applied with virtually no tooth structure removed. Are applied to teeth whose underlying tooth structure is intact and healthy. Are typically used in scenarios where the underlying tooth needs to be rebuilt because it is badly broken or decayed. Require that you trim away a significant portion of the tooth, so once a crown is placed on a tooth it will always be required. Dr. Browne will ensure that your veneers are crafted from the highest quality ceramics and that they are bonded with the most advanced durable materials available. Refraining from using your veneers as tools to open and cut things will prolong their life. If accidental damage occurs to the veneers, it is usually possible to replace only the veneer involved. The amount of time a veneer can last depends on the individual patient. The average lifespan of a veneer is approximately 10-15 years. If you are interested in getting veneers, please call our office (406) 442-0282 or contact us, and we can schedule an appointment to develop a plan of care. You can also navigate back to our general services page.